Data sheets and more information about Dotfuscator. Read up on the latest Dotfuscator news. Read how PreEmptive is redefining obfuscation protection. The State of Application Security: Is Your Company at Risk? For user guides and documentation, visit the Support page. The New Way To Integrate Dotfuscator Into Your Build Is So Easy It Can Be Done Blindfolded! 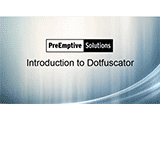 Don't believe us how easy it is to configure Dotfuscator? Then watch this video. This webcast goes deeper into the topics covered in our recent blog post: The Six Degrees of Application Risk and offer some real-world scenarios. This 12 minute demo and presentation steps through the risks that debugger hacking pose and how these risks can mitigated through prevention, detection, real-time defense, and analysis. This quick six minute video will show you how easy it is to reverse engineer .NET code and how Dotfuscator protects can help protect it. This video demonstrates how “binary equals source code” in the world of .NET and Java and steps you through the kinds of risks that reverse engineering can pose and how application hardening can help. With Dotfuscator, obfuscating and instrumenting your application is effortless regardless of how you choose to deploy it. Just select any Silverlight application and click 'Build'. Have an App Worth Protecting? Try Dotfuscator Today!